This page is for participants in NTCIR-9 tasks. Anyone who did not participate in the tasks set by the NTCIR Workshop 9 is invited to submit their papers to EVIA 2011.
we invite submissions to EVIA 2011 from NTCIR-9 Task Prticipants, too! Every NTCIR-9 active task participant is required to make a presentation at digital poster session irrespective of oral presentation. --->Instructions for Poster and Demo Sessions are here. Speakers are selected on the basis of the contents of draft papers (3-4 speakers for each task). Notification will be made by task organizers, by early in November. --->Oral Presentation Guideline is here. Every active participant who conducted the task(s) set by the NTCIR Workshop 9 must write and submit a paper for the Proceedings of the 9th NTCIR Workshop Meeting, regardless of attendance of the Workshop meeting. Please follow the guideline on the web: author guidelines. When you make a new submission, please fill in the submission form in the Easy Chair system accurately. The table of contents for the proceedings will be compiled due to these information. Data registered in the Easy Chair (Title, abstract and authors) on October 26, 2011will be officially used in the proceedings of NTCIR-9. Therefore, it is strongly recommended to input the final version of your abstract before submitting your final PDF (needless to say, data on title and authors in the Easy Chair have to be also identical with descriptions in your PDF). (b) copyright form using the form (NTCIR-9: [pdf] [txt], EVIA 2011: [pdf] [txt] ) we provide for the Proceedings. Please send copyright form to NTCIR Project Office by Postal mail before October 26, 2011. (c) PDF version of the paper. Further information is available here. After you submit it electronically on September 20 (or paper for the Proceedings (draft) due), the task organizers will read them and provide some comments for enhancement or modification or clarification if appropriate. After revision and enhancement based on those comments, the final camera-ready copy must be submitted no later than November 04, 2011 in PDF. (Please understand this is really firm deadline! 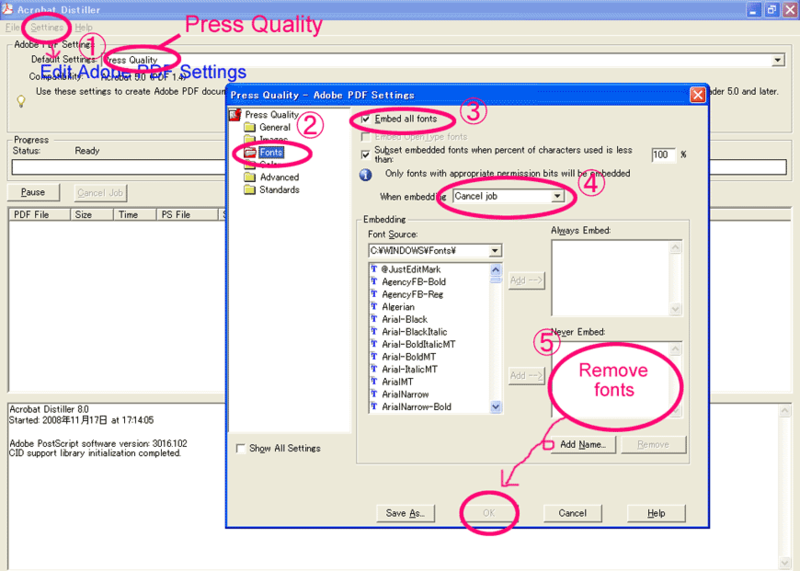 )*Please make sure you produce a high quality or a press quality PDF with all necessary fonts embedded, and disable all security options. For Acrobat, please refer to the attached JPEG or PNG file. For others, please use the "embed fonts" option for OSX's Preview application. can not be printed properly. We are using the Easy Chair conference management system to track submissions for the conference. Please submit your paper to the correponding link using the NTCIR-9 Easy Chair system. If you have any problems or questions about the electronic submission process using the Easy Chair system, please feel free to contact the appropriate task organizer. Submitted papers should be in the ACM Conference style(paper size: Letter 215.9x279.4) and must be submitted as pdf files. Please insert the information below between 'Keywords' and '1. Introduction'. Your official team name. This is usually the prefix of your run names. List up all subtasks that you participated, with the language information. List up all external resources (programs and data) used to produce your runs, including test collections from other NTCIR tasks. No need to list up resources officially provided by the task itself. The ACM template gives instructions to leave blank text box at the bottom of the left column of the first page for the copyright notice. Regardless of this instruction, no blank text box or no copyright notice is needed when you write a paper for the NTCIR-9 and EVIA Proceedings. Please ignore it. Please use a 9-point Times Roman font, or other Roman font with serifs,　as close as possible in appearance to Times Roman that you have access　to. If Times Roman is not available, try the font named Computer Modern Roman. On a Macintosh, use the font named Times. Right margins should be justified, not ragged. The title (Helvetica 18-point bold), authors' names (Helvetica 12-point) and affiliations (Helvetica 10-point) run across the full width of the page - one column wide. Papers must not exceed 8 pages for one task. ("task" means either of CrossLink, GeoTime, INTENT, PatentMT, RITE, SpokenDoc or Vis-EX) in 9 point font. (1) Manuscripts of task overview will be partially available by September. Participants will be able to refer to the task overview in order to explain the task design or basic statistics in the paper. Please avoid describing redundantly such basic information in your paper. (2) Papers in the Proceedings will be also published on the Web in the form of PDF files.